Speed networking: Speed networking allows students to speak to a range of volunteers in an informal setting. Students sit in small groups with a volunteer, spending around 10 minutes hearing about the volunteer’s job and asking questions about their career and career route. Volunteers will rotate around the student groups, giving students the opportunity to hear from a range of different jobs in a short period. Typically, speed networking sessions will last between 1-1.5 hours and students will speak to up to 10 different volunteers during the session. 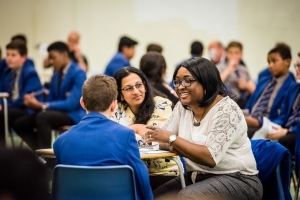 Assembly talks or presentations: Volunteers can speak to larger groups of students to help inspire them and to increase understanding of different jobs in the world of work. Topics could include their career to date, focus on their current role or sector. Talks can act as insight in to the daily life of working in a given field or role, and support the broadening of career aspirations. Subject talks: Many Inspiring the Future volunteers have indicated on their volunteering profiles which subjects they feel their jobs relate to. By inviting these volunteers in to give talks in lessons, teachers can help to increase motivation and participation in the classroom by providing real life examples of how certain subjects or topics can be applied in the world of work. Volunteers could talk about how they use maths in their work, or to talk about the importance of languages within their role. Mock interviews: Schools can host a wide range of volunteers who can act as interviewers, giving students a chance to experience what a real job interview might be like. CV Workshops: Volunteers can be used to supplement career or employability events or sessions, through supporting work on CVs. Volunteers can be asked to take part in sessions that provide feedback on CVs, or asked to run workshops on constructing a successful CV. These activities will allow students to gain feedback on their current CVs, so that they can prepare themselves fully for when they do apply for jobs, giving them the best chance of securing a job.